You will find below a few elements of analysis of the 2nd WFSD. To create the logistical conditions to succeed. To facilitate the involvement and the participation of regional organizations and scientific institutions (“café-causeries” before the event, discussions and debates with African social actors). Enda-Diapol was naturally integrated to the International Secretariat and deeply contributed to the success of the event in the difficult context of the WSF activities. This first parameter largely explains the “quality” difference with the first edition of the SDWF (such a partnership with a local organization did not exist even if many local researchers participated to the event). As often, the quality of the involvement and of the local/national/regional rooting constitutes the first criteria for success. Thanks to its networks and its own activities, Enda-Diapol was able to concretize an essential institutional partnership with the IRDC (Canadian governmental institution, which accepted to actively participate to facilitate the presence of African researchers. The main part of African actors, who were part of the plenary sessions’ panels, were suggested by the IRDC. The dialogue between the IS and the IRDC coordinators was a high-quality one and based on a strong mutual trust. Our “privileged” links with the organizers of the World Social Forum (WSF) in Dakar complemented the frame of links between the SDWF and African actors. Around one hundred students of Cheikh Anta Diop University followed the activities of the SDWF. They did not expressed themselves a lot during the event itself but they actively participated to the workshop organized during the WSF on February, 8th. A lot of them will be part of the strengthening of the process in the years to come to reinforce regional strategies of the SDWF. At last, it is important to mention the fact that two regions that organized activities between the 1st and the 2nd edition of the SDWF to allow a better regional rooting of the process: the Science and Democracy Forum in Québec and the French process we already mentioned. This continental rooting and maybe even more the sub-continental one constitutes major stakes of the SDWF. Contrary to what we were afraid of, the presence of actors of research was more “massive” than in 2009, with 40% of participants. Actors of “humanities” were the most represented ones. The majority typology of present researchers was not the one of “outsiders” or “marginalized” people, that is a crucial point for the future of the process. In other terms, the SDWF, in 2011, was not a space of expression/federation of minority researchers in their field of expertise. “Mainstream” researchers, heads of laboratories were present in the majority. Whistleblowers and “marginalized” scientists were present too, but there were not any frontal confrontations between scientists. It shows that the nature of the space was really understood by all delegates. The active participation of the IRDC proves that such a space is relevant for activist-researchers but also for “mandarins”. This delicate balance allows a better politicization of the stakes and perspectives of partnerships and collaborations in the future. Heads of scientific institutions or laboratories found their place in the sharing of experiences and their participation to discussions after the 2nd SDWF proves that perspectives of permanent sharing are possible. This state of affairs will have consequences on “communication aspects” because we do not think, as a fringe of social movements would appreciate to, that scientists are “on the other side”. We consider them as scientific and knowledge workers, who are under a growing pressure, who would like to find again some leeway and who get benefits from the opportunity to share deeply with civil society actors to “refresh” their vision and involvement. Common interests can be identified in such a space. So there were not bad intentions, invectives or caricatures from one category of actors to the others. This is very important because it gives the opportunity of interesting overtures on different territories (France, Spain, Italy, Canada, Brazil…) for wider spaces of political debates. In that sense, the global crisis faced by the academic world (consequences of neoliberal reforms, evaluation, economical and financial pressure, bureaucracy…) opens the way to partnerships with social actors, who are potential allies for the struggles to come. According to us, this constitutes a first element of reading and strategic analysis on the positioning of the SDWF and on its future. This SDWF must be the place of politicization and visibility of tensions within these fields but it is “conditioned” by the connexions of institutions with society, which are necessary for the debate. Second element of strategic reading: the epistemological question raised at the early beginning of the 2nd SDWF and it irrigated the two days of the forum. It proves that the double stake of the “relation” to knowledge and the nature of “useful” knowledge is a main common preoccupation, which got formalized progressively during the two days. It was a real surprise because we were not expecting such a level of subtlety in the definition of the stakes. According to us, it is a validation of the chosen open-method, of the manner to animate the two days, of the trust built with delegates without pre-requisites. For example, the proposition made to create a network on pedagogical innovation in universities (new curricula) got the “agreement” of at least 6 universities on 4 continents. La proposition faite par exemple, de créer un réseau sur l’innovation pédagogique dans les universités (nouveau curriculum) a remporté l’adhésion d’au moins 6 universités sur 4 continents. Another proposal was made on the organization of a seminar for French NGOs on the stakes of research to try to identify a majority-position on the “critics of technological innovations” to allow interventions in the public space on the stakes of governance and research programs. This proposal should lead to a concrete proposal for the beginning of 2012. The convergence between these categories of actors creates the conditions of a common legitimization, in the hope of a better definition of common work, concerns and agendas. 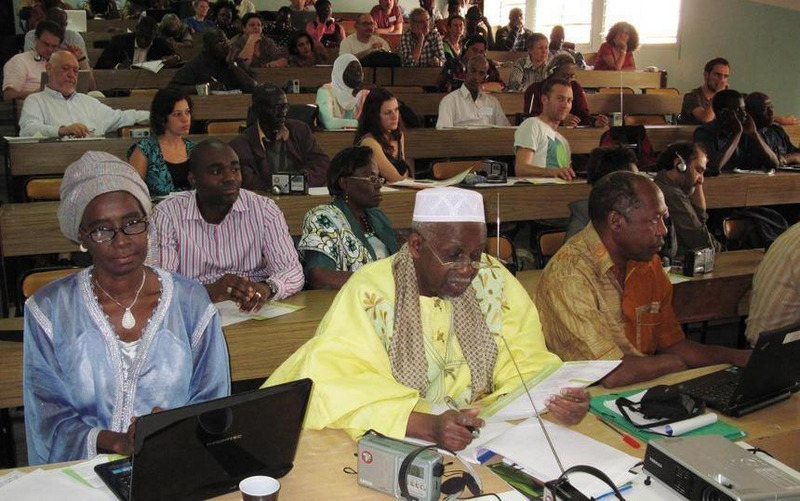 A strong political indication – the presence of SDWF delegates in the convergence process of the World Social Forum. The World Social Forum was structured to allow a political work of convergence to find agreements between platforms for common work and mobilization. One of the assemblies, which gathered a large audience, was organized by iBase and dealt with the stakes of Rio+20. Seven organizations were invited to express proposals, five of them were active members of the SDWF. In that way, even if it would not be efficient for the process to focus exclusively on socio-ecological issues but much more on socio-scientific issues, this state of affairs shows that the SDWF federates scientific and civil society actors, which can mobilize and gather. The youth network YPSSI, kind of Youth SDWF, also expressed its wish to go further on these issues. Last point we would like to mention about the strategic dimensions of the SDWF: the place of youth, the question of unemployment of young graduate, “pauperization” of the scientific and knowledge workers, inadequation between studies and jobs, were deeply discussed during the SDWF and the WSF. The social issues are becoming central ones in the SDWF process. It constitutes a real “gain” of the process.